...Outer space, once a region of spirited international competition, is also a region of international cooperation. 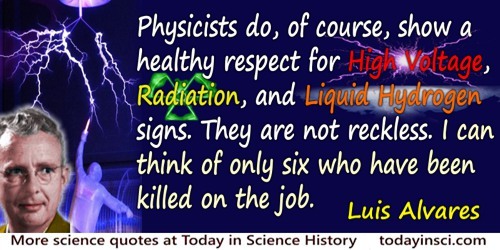 I realized this as early as 1959, when I attended an international conference on cosmic radiation in Moscow. At this conference, there were many differing views and differing methods of attack, but the problems were common ones to all of us and a unity of basic purpose was everywhere evident. Many of the papers presented there depended in an essential way upon others which had appeared originally in as many as three or four different languages. Surely science is one of the universal human activities. Everybody is exposed to radiation. A little bit more or a little bit less is of no consequence.. Quoted in 'Dixy Lee Ray, 79, Ex-Governor; Led Atomic Energy Commission' obituary, New York Times (3 Jan 1994). From 'The Principles of Success in Literature', The Fortnightly (1865), 1, 66. I found out that the main ability to have was a visual, and also an almost tactile, way to imagine the physical situations, rather than a merely logical picture of the problems. … Very soon I discovered that if one gets a feeling for no more than a dozen … radiation and nuclear constants, one can imagine the subatomic world almost tangibly, and manipulate the picture dimensionally and qualitatively, before calculating more precise relationships. In Adventures of a Mathematician (1976), 147. If a body releases the energy L in the form of radiation, its mass is decreased by L/V2. Annalen der Physik, 1905, 18, 639-641. Quoted in Alice Calaprice, The Quotable Einstein (1996), 165. Quoted in Esther Stineman, American Political Women (1980). My experiments proved that the radiation of uranium compounds ... is an atomic property of the element of uranium. Its intensity is proportional to the quantity of uranium contained in the compound, and depends neither on conditions of chemical combination, nor on external circumstances, such as light or temperature. ... The radiation of thorium has an intensity of the same order as that of uranium, and is, as in the case of uranium, an atomic property of the element. It was necessary at this point to find a new term to define this new property of matter manifested by the elements of uranium and thorium. I proposed the word radioactivity which has since become generally adopted; the radioactive elements have been called radio elements. In Pierre Curie, with the Autobiographical Notes of Marie Curie, trans. Charlotte and Vernon Kellogg (1923), 96. Also in reprint (2012) 45-46. So the dividing line between the wave or particle nature of matter and radiation is the moment “Now”. As this moment steadily advances through time, it coagulates a wavy future into a particle past. In The Development of X-ray analysis (1975) 13. 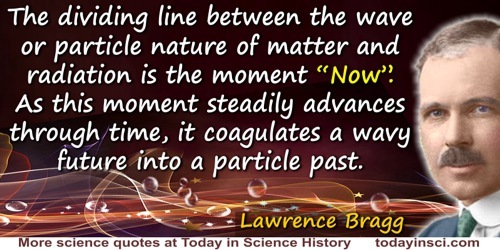 The dividing line between the wave or particle nature of matter and radiation is the moment “Now.” As this moment steadily advances through time it coagulates a wavy future into a particle past. The incomplete knowledge of a system must be an essential part of every formulation in quantum theory. Quantum theoretical laws must be of a statistical kind. To give an example: we know that the radium atom emits alpha-radiation. Quantum theory can give us an indication of the probability that the alpha-particle will leave the nucleus in unit time, but it cannot predict at what precise point in time the emission will occur, for this is uncertain in principle. The Physicist's Conception of Nature (1958), 41. The Judeo-Christian tradition describes the beginning of the world in a way that is surprisingly similar to the scientific model. Previously, it seemed scientifically unsound to have light created before the sun. The present scientific view does indeed assume the early universe to be filled with various kinds of radiation long before the sun was created. In concluding paragraph of 'The Origin of the Universe: An introduction to Recent Theoretical Developments That are Linking Cosmology and Particle Physics', American Scientist (Sep-Oct 1983), 71, No. 5, 480. The tendency of modern physics is to resolve the whole material universe into waves, and nothing but waves. These waves are of two kinds: bottled-up waves, which we call matter, and unbottled waves, which we call radiation or light. If annihilation of matter occurs, the process is merely that of unbottling imprisoned wave-energy and setting it free to travel through space. These concepts reduce the whole universe to a world of light, potential or existent, so that the whole story of its creation can be told with perfect accuracy and completeness in the six words: 'God said, Let there be light'.